Did you know that gardening can reduce your risk of dementia by as much as 36%? Researchers in New South Wales, Australia followed some 2,800 senior citizens for 16 years and discovered at the end of the study that those among the participants who were active gardeners had dramatically lower rates of dementia. Being outdoors in the fresh air, playing in the dirt, and soaking in the sounds and smells of a beautiful garden can also reduce stress and boost your mood. And that’s even before factoring in the fruits — and vegetables, and flowers! — of your labors. Read on to discover more of the great benefits of gardening. When you think of “moderate-intensity exercise,” what comes to mind? Jogging, mountain biking, hiking, or swimming laps? What about gardening? That’s right, gardening is good exercise. Many people consider it the best kind of workout since it doesn’t feel like working out at all. However, there are a few things to remember if you want to get the most from your digging in the dirt. First, don’t overdo it. A mere 30 minutes’ worth of gardening provides the heart-health benefits you’re looking for. If necessary, you can split that time into two or three shorter sessions. Don’t forget to protect your skin from the sun by using sunscreen that’s 30 SPF or higher, or by wearing long pants, a long-sleeved shirt, and a sun hat. Make sure to drink plenty of water, too. And if you’re going to be doing strenuous digging or hoping for more than a few minutes at a stretch, warm up first and cool down afterward. This type of exercise can really get your heart going. Another physical benefit of gardening is that it can help your hands stay limber. Grasping trowels, pulling weeds, and cultivating plants can go a long way toward improving your fine motor skills, coordination, flexibility, and hand strength. Using your hands in the variety of ways that gardening requires can assist in keeping arthritis pain at bay. It’s also a good antidote to all the typing, swiping, and other tech-related repetitive motion. Remember to make the most of gardening when it comes to your hands by using each of them equally. Not only will this alleviate injury or strain that could result from using only your dominant hand, but it helps you build your sense of self-control and may even keep your brain sharp. 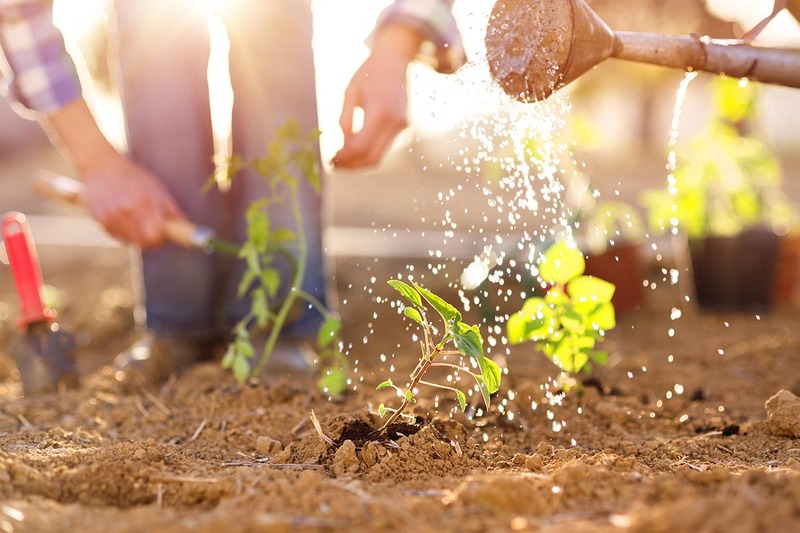 Speaking of your hands, here’s some good news for those of you with a little dirt under your fingernails: playing in the soil can actually boost your immune system function! Turns out there’s a bacterium in the soil called Mycobacterium vaccae. This is one of the friendly bacteria, the kind that improves rather than threatens our health. Studies show that Mycobacterium vaccae can alleviate the symptoms of many illnesses and conditions. If you suffer from psoriasis, allergies, asthma, or depression, this bacteria could help you to experience fewer symptoms and feel better in general. Another way that gardening benefits your immune system is through the Vitamin D that your body naturally makes when it spends time in the sun. So go ahead and get outdoors; just make sure to limit the time you spend in the sun without protection from dangerous UV rays. While we’re on the topic of your immune system, it’s important to remember that not every critter found in nature is beneficial. Intending to your yard, find out how to get rid of pests like rodents and ticks to avoid serious diseases like hantavirus and Lyme disease. Keeping your yard and garden pest-free will safeguard your family’s health and that of your family pets, too. Have you ever gone outdoors to a garden when you were feeling grouchy or glum? Chances are that when you came back indoors after a session of working in the earth, your bad mood had lifted. There’s some scientific evidence to back up this phenomenon. Even researchers at NASA have discovered that an individual’s negative feelings — namely, stress, isolation, and loneliness — can be effectively addressed by tending to plants. While being outside in the fresh air certainly can be responsible for lifting one’s mood, the mental health benefits apply even when planting seeds in small indoor pots. Other studies have looked at the effects of gardening on the body’s cortisol levels. You might recognize cortisol as the so-called “stress hormone.” When your levels are lower, you feel calmer. Lowered cortisol levels have also been linked to reduced risk of heart disease, high blood pressure, obesity, insomnia, and depression. There’s something about turning to nature, nurturing something, and watching it grow, that seems nearly essential to humans’ well-being. That connection to the natural world also raises people’s self-esteem and builds self-confidence. It makes sense: what could be more of a beneficial ego boost than taking a small, seemingly inert seed, planting and watering and watching over it until it bears fruit — literally? There is a sense of pride, self-worth, and purpose in growing fruit, flower, or vegetable. Those who grow their own food get even more health benefits since vegetable gardeners are more likely to eat a balanced diet that includes plenty of their own crops. Of course, you probably don’t need double-blind studies and academic research papers to tell you that gardening simply feels great. And maybe you’ve never taken the time to think about the various benefits of gardening and how they work to keep you healthy. All you know is that you’re not yourself when you can’t get outdoors to dig in the dirt and that you never feel better than after a day spent weeding your seedlings or harvesting your herbs. What positive impact has gardening had on your physical and emotional health? Do you notice a difference when you can’t work in the garden for a few days? Share your thoughts in the comment section below!